Earlier today, we predicted that Hall of Fame trainer deluxe Bob Baffert would have to pull some magic touch to win this year’s Grade 1 Gold Cup at Santa Anita. 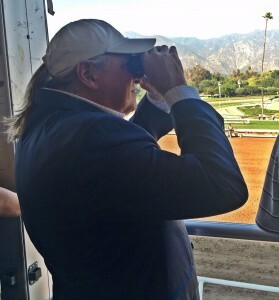 On Saturday, Baffert pulled back his bow and let his arrow go – and it went straight to the bullseye. Like we predicted, Cupid – coming off an extended layoff – showed off his skill and talent running away with a convincing victory in the $500,000 stakes at Santa Anita. Follow Me Crev, with jockey Kent Desormeaux up, rallied for second, over Hard Aces, who closed to be third. Midnight Storm was fourth. He was better than good. He was overwhelming, easily drawing off in the stretch for a powerful, convincing statement to begin the next phase of his racing career. Just a year ago, Cupid looked to be on the Triple Crown trail after winning the Rebel Stakes at Oaklawn. But after he faltered, he was turned out and allowed to grow up. Baffert doesn’t have any immediate plans for Cupid now. But he will steer clear of Baffert’s other big boy – Arrogate. “We will ship him out of town for some of those bigger stakes later in the summer, but we don’t want them to meet up too soon,” said Baffert. Jockey Rafael Bejarano was impressed, too. “When I asked him, I knew I hade a lot of horse,” he said. Santa Anita is known throughout racing circles as “The Great Race Place.” On Saturday, it sure was. Lady Eli – the East Coast shipper who has overcome both fantastic fields of would-be fillies on the grass courses of America and a widely reported bout of laminitis that nearly ended her spectacular career and life – showed exactly why she is one of the best to ever race on Saturday. At the very least, no one can challenge her grit and grind. Lady Eli, ridden by Irad Ortiz, Jr, finally wore down her pesky rival Avenge as the pair turned for home as a tandem, and then held off the fast-closing Goodyearforroses to capture the Grade 1, $300,000 Gamely Stakes at Santa Anita at 11/8-miles on the turf. Lady Eli – who was bet down to 2-to-5 odds in a field of only six – has now won Graded Stakes races at the ages of 2, 3, 4, and, with this victory, 5 years old. And, if that wasn’t enough reason to celebrate, Lady Eli pushed her career earnings over $1 million at Santa Anita – alone. It was a great moment for the owners – Sheep Pond Partners, too. They were in full attendance at Santa Anita last November when Lady Eli lost a head bob at a grueling finish in the Breeders’ Cup. Saturday was a nice way to wash that taste away. Findley’sluckycharm, who entered the day with a perfect 4-for-4 record on the Churchill Downs dirt, never gave any of her connections and the crowd a moment of concern, sprinting clear from the 6-hole in the starting gate and then romped to an easy open lengths victory over the 6 furlongs. At the end, jockey Brian Hernandez could have made the final margin as big and as comfortable as he wanted, and that was the way trainer Bret Calhoun drew it up. Calhoun’s other entry into the stakes, Mayla, held on for second at 18-1. Sweetgrass, who gave many lengths to the winner at the start, made a strong move entering the final turn and had to wait behind a wall of horses before being drifted widest of all. She finished willingly, but was no match for the winner. Again, nobody was on this day. “She’s an extremely talented filly. How she got beat in that Grade 1 in California (La Brea) is amazing to me, but she is a very, very talented filly. She is naturally fast. I just try to stay out of her way and let her do her own thing,” said jockey Brian Hernandez, talking with Churchill Down’s television host Joe Kristufek after the race. Finley’sluckycharm was so impressive that she overshadowed everyone on a gray day. The victory was worth $60,760 and bumps Finley’sluckycharm’s earnings to $344,468 with a record of 7-1-0 in nine starts. This was her first graded stakes win and third stakes victory overall. Following a narrow half-length loss to Constellation in the Grade I La Brea at Santa Anita in late December. Finley’sluckycharm made her first start of the year on April 29 at Churchill Downs and recorded a 3/4 length win over Athena in the $65,340 Roxelana Overnight Stakes. Prior to the La Brea, she won the $82,400 Dream Supreme Overnight Stakes at Churchill Downs in late November by a jaw-dropping 8 ½ lengths while clocking six furlongs in 1:08.58 – a stakes record for the 12-year-old race. It would turn out to be almost a match race, with only four horses filling the starting gate. Stormy Liberal won his fourth race in a row by nipping ambitious rival Ambitious Brew by a head. Mike Smith, the rider of the second place finisher, cut the corner on the 6 1/2-furlong downhill course and took a small advantage coming into the stretch. But his chances were short-lived as jockey Norberto Arroyo edged up on the outside, with little urging at all, to grab the narrow win under hand. Big Handsome, trained by Anthony Dutrow and ridden by newly elected Hall of Famer rider Javier Castellano, entered the starting gate as the odds-on, 4-to-5 favorite in what has to be considered a robust field of eight – compared to the light starting gate loads at Santa Anita. But it didn’t look like it was a strenuous exercise at all for the big guy, as he geared up in the turn for home and then bounced away into mid-stretch to easily pull off to an impressive, eye-catching 6-length victory over Kitten’s Cat. Small Bear, one of the pace presence horses in the field, held on for third in the $100,000 event contested over 7 furlongs. Harlan’s Harmony was up for fourth.